I’m passionate about raising my kids to love their bodies, to be confident, body positive and to know how truly beautiful they are inside and out. A recent post I shared on facebook showed how many others are also passionate about this and how as parents we play such a major role in shaping our children’s thinking. It’s a hugely responsible role and probably not one I am going to get 100% right, but I’m going to try. As a child I was brought up knowing I was 100% capable. I believed in myself and knew I could do something if I set my mind to it and put the work in. That has stuck with me. So therefore how we talk about our bodies and our childrens bodies will also stick with them. Always be positive about your body. If there are parts you are not keen on don’t make it into a big deal in front of your children. Talk to your children about body sizes and shapes. How we are all different and that is ok. How it is health that counts and not looks. How there is no ideal body shape and that many toys are not real-life. (BTW Barbies are not welcome in my house we have Lottie dolls instead). Keep away from diets, intense exercise for weight loss purposes and weight loss aids/supplements in front of children, they will pick up on these things. Try not to weigh people in your house – is it really needed? The scales do not show much apart from a number. That number is affected by some many factors other than just what we eat. I have scales for work purposes and the children do play with them now and again but there is no judgement, just genuine interest. Focus on character and traits instead of physcial size/shape. Let your kids know what they are great at and how that is what defines them. Role model a good relationship with food. All foods are allowed, there is no good/bad. If your and food need some work, then perhaps now is the time to seek out help with that. Someone like myself who can support you and take you on a journey to improve your relationship and show your kids a great way forward. Let’s talk childrens menus when eating out. This can be a topic of division in my mind and in general amongst parents. 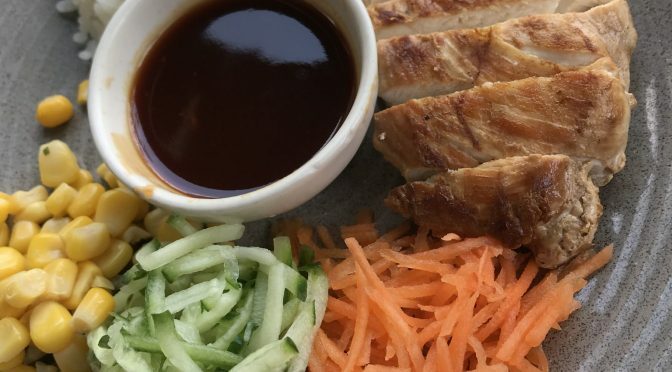 I doubt many people choose where they eat out based soley on the kids menu but when you are eating out with small ones it is hugely important. Often childrens menus are high on beige foods and low on colours. I’m talking fishfingers, nuggets, burgers, chips, potato waffles with maybe beans or peas but not much else. I totally get why, as a restaurant you want children to enjoy their meal and hey, it’s only one meal. So does it really matter? I think it does. Children are little adults, as an adult I want choice, flavour, foods that I don’t usually eat at home, foods that make me think and that my tastebuds explore. Beige food menus are devoid of a variety of tastes, textures, fibre and colours. All things we want kids to be eating. Now for my kids eating out is a complete treat. We don’t do it that often. I also don’t tend to offer “beige meals” often at home, unless they are requested. Not that I am against those foods, they have a place. However, I prefer to go for plenty of veggies and variety, aiming for homemade foods when I can. So we may have fishfingers from the freezer but I’d serve them with a mixture of veggies, potato wedges, with the skin on and thus provide a range of nutrients, fibre and tastes. Nuggets and fishcakes can totally be offered as part of a balanced diet but do they need to make up the majority of children’s menus when eating out? I think not. Let’s get some balance on the menu please. Miss K totally loving her ramen bowl. If we start to offer variety and treat children as little foodies maybe they will start eating in this way? 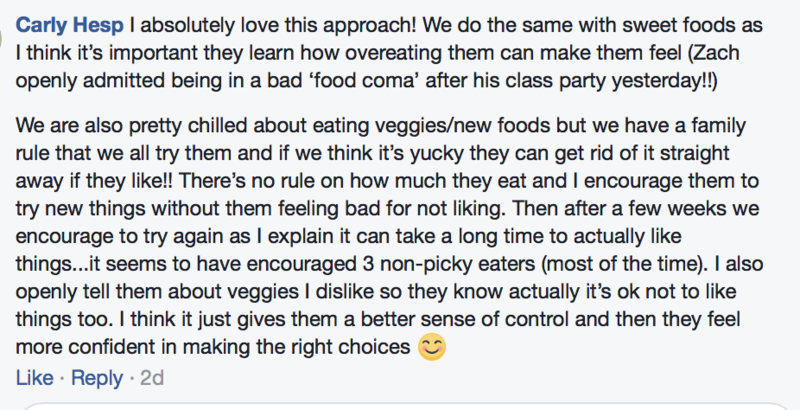 Having had a boy who was anti-vegetables I’ve had first hand experience of how consistency, being non-judgemental and continual exposure works. So if we only offer beige foods they will only eat beige foods! 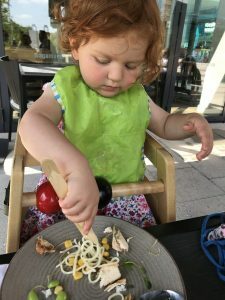 This is part of the basis behind raising intuitive eaters, as parents we offer a range of foods and let them choose how much and what to have. My crazy kids actually get a bit excited about a kids menu but at times I get “why is my food not as nice as yours”. Which has led to us ordering an adults meal for the kids to share or of course sharing our own meals. I do remember at a wedding the sausage and chips being shunned in favour of the delicious buffet. 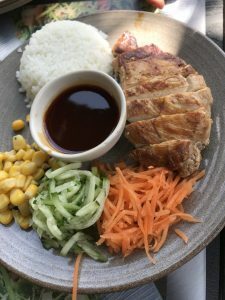 When travelling I encourage the children to try cultural foods and things they have not had before – with varying results but it’s all about continuing to promote these values and ideas. Eating out is about pleasure and enjoying meals different to those at home. My 7 yr old especially loves eating “adult meals”. So I love places who make small versions of the adult menu. In my mind this is how it should be. 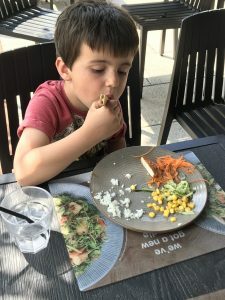 Yesterday we ate out at a restaurant that did an amazing menu with kid friendly versions of their dishes – no chilli, smaller portions and some meals where all the foods were separate for those, like my boy, who would have wanted to pick bits out. They were also happy to make changes to the kids meals. My children were VERY happy. This boy, so happy with his meal and he demolished it. It’s all about enjoyment, choice, variety and #empoweringkids to do this. I see it as part of intuitive eating, letting them choose what to have and how much to eat. My kids are very different in their eating and how they eat but all loved their lunch out today. 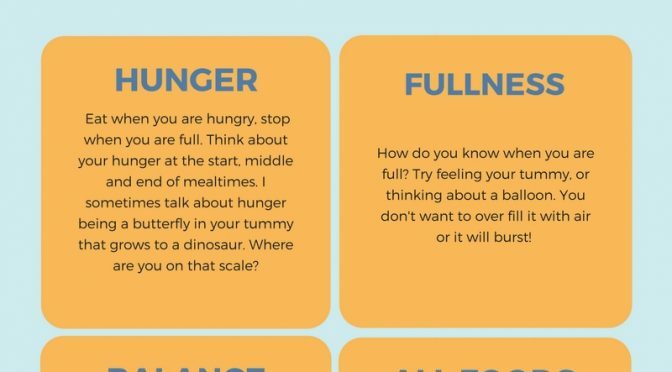 How do we know when we are hungry/full? In a completely perfect world we would eat when hungry, stop when full and eat the foods our body tells us to eat. However few of us are that tuned into our bodies signals. We are bombarded with outside signals for example the media, advertising, other people, shops, restaurants – food is all around us. You walk down the road and pass someone eating a burger, “hmmm I fancy one of those now”. Then you pass a billboard advertising ice-cream, “oh I could eat an ice-cream later”. Then someone in the office has a birthday so you have a slice of cake. Later on the radio is advertising a meal deal which makes you think of buying one for your lunch. In the shop you are standing waiting to pay and see a cereal bar so pick it up to nibble on. All those extra signals that are overriding your actual body signals. It’s all so easy to be overwhelmed by the external and takes a lot of quietening ourselves to hear the internal cues. Many people I work with cannot actually initially pinpoint what hunger feels like. I ask how hungry they are and am met with a confused look. Hunger on the one hand is quite a simple idea, your body is hungry, it tells you, you eat. Other the other hand it is complex, so complex. There is head hunger, body hunger, stomach hunger, emotional hunger. Here is my 7 year olds take on how she knows she is hungry. I think this is such an important conversation to have with children AND adults. So have a think this week, how do you feel hunger and how hungry are you before you eat? 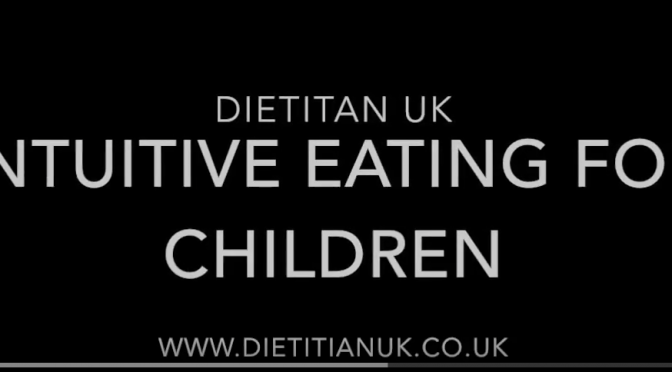 The non-diet approach for children. In a time when there is a focus on reducing sugar, countering obesity and improving the long term health of the nation, it can be hard to know how to approach these topics with your family. 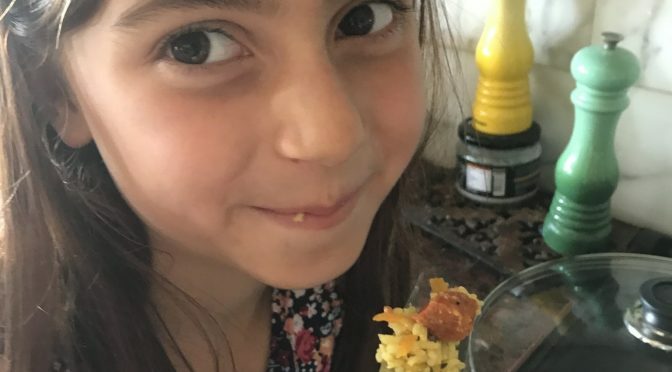 On the one hand we want children to be aware of what is in food but we don’t want them to be obsessing over it or feeling they need to go on a diet. Personally I think that teaching children about nutrition, food preparation, healthy behaviours and their bodies early on is really important and can be part of the solution that our society needs. So as a mum I do my best to educate my children on a daily basis. Simple messages that we use are “There are no good of bad foods but some foods we eat less of as too much of them are helpful for our bodies”. We also talk about what is in a food and why it is good for us – often using “Funky Facts” such as the fibre in bread or the vitamin C in a kiwi. Top facts like this are things I find they store up and remember. We may talk about dental health or how out tummy feels if you eat too much of certain foods. Both my older children (age 4 and 7 yrs) can associate with a time they have eaten sweet foods and felt unwell from it! I love talking to them about how their tummy feels and what do they feel it needs as well as what does it want! I prefer to focus on these messages rather than focusing on weight/size/shape. Being a dietitian who works in the eating disorder field I am well aware of the issues that can occur when there is too much of a focus on weight, shape, size and how your body looks. 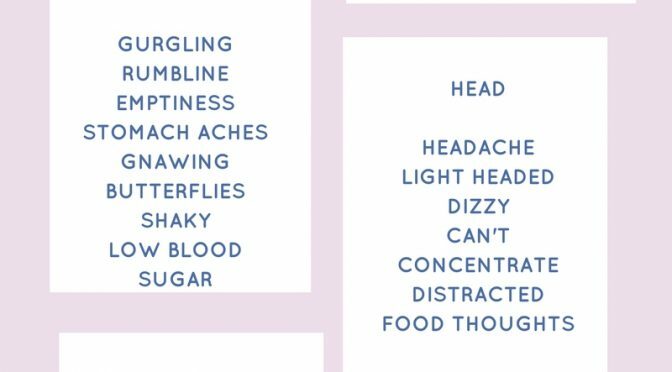 Instead I like to focus on the enjoyment of food and on healthy behaviours such as being active, getting fresh sunlight, being outside and taking care of our teeth, hair, nails. Ever get the feeling that the children in the house are in charge? Oh my days, I know I sometimes feel like I just run from child to child doing things for them! Letting them be in charge of some things can be empowering and really positive. When you think about it there isn’t that much that they are actually in charge of. That can be hard as these little people want a chance to grow their independence and show their preferences. Eating is one of the ways that they can do this. So from a very early age they can show which foods they like/dislike and how much they want to eat. As parents it is whether we take note of these signs or think we now better! I’m trying to raise my children as intuitive eaters but it is hard as often I think I know their tummies better than they do. I then have to sit back, breathe and let them lead. When you are in a rush or have other children to also look after it can be frustrating to do this but we are setting our children up for life. I want mine to know how to pause, think about how their bodies feel and then respond accordingly and not be rushed because I have a schedule. I find toddlers fascinating as they are so in tune with their bodies. My 22 month old will literally refuse to eat when she doesn’t want to, there is no way I can force her. She now chooses what she wants to eat from a selection of foods and she tell me when she is hungry with “Eaaaaaa” or “Snaaaaa”. A funny example this week was when I made a cake for Mothers Day and then we had some for pudding. 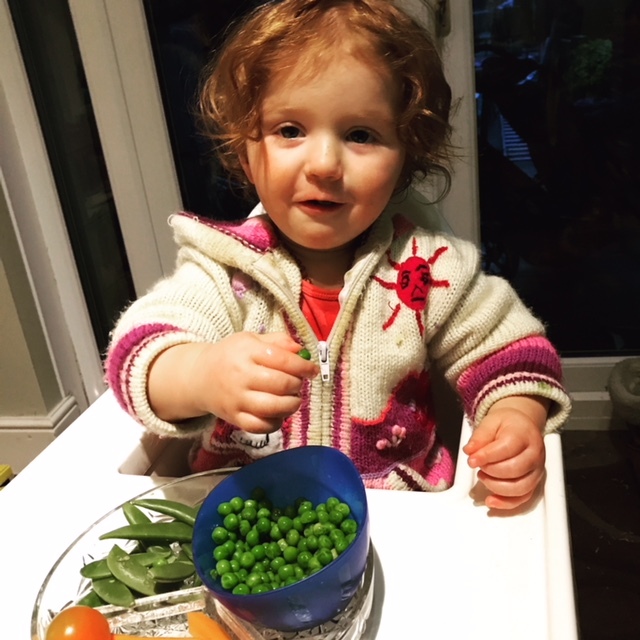 However the toddler shunned it and ate a bowl of peas instead! Listen to Hunger – eat when you are hungry, stop when you are full. Think about your hunger at the start, middle and end of mealtimes. I sometimes talk about hunger being a butterfly in your tummy that grows to a dinosaur. Where are you on that scale? Listen to Fullness – this can be fun with kids. My 4 yr old boy pokes his tummy and that can help him connect with how full he is. My 7 yr old girl just knows and will leave her food for later. 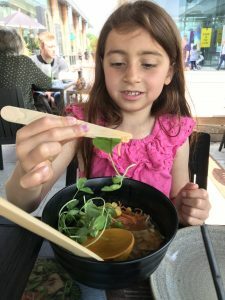 Eat a balance – I teach my kids that all foods are great but that our bodies need balance for energy, protein for building, fat to keep us warm and protect our organs and all the vitamins/minerals to keep it working properly. There are no good/bad foods. I love this conversation with my children. We’ve used plastic foods to group them into food groups and then talked about what all the foods contain that is great for our bodies. Instead of foods being good/bad for us I talk about how we need to moderate foods that are higher in sugar due to our teeth and balance our snacks as biscuits don’t keep us full for long. I’d totally encourage you to let your children lead a bit more with food. If you want more tips on how we do this at home then do let me know. 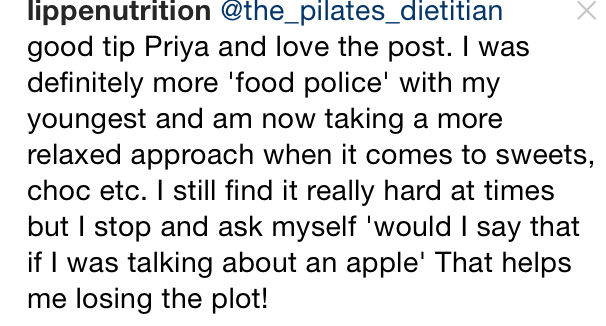 It seems a lot of you out there are interested in teaching your children about intuitive eating. Which is absolutely amazing! I’m over the moon. Absolutely loving the little experiments people are doing at home too. After a few comments and questions about the last blog post I thought I’d do a post on how we talk about nutrition at home. Again this is not a perfect method and I don’t know it all but I am seeing the benefits in my children. Me: “Because Miss E wanted them” (she is a grape-a-holic, though she hasn’t tried wine yet!). J-boy: “Well we shouldn’t just eat the same foods we should have different colours and types”. Is it just me who is amazed when their children actually listen and take on board what you say? Take the relaxed road. Several people asked me how can I be sure the kids won’t over eat the food like sweets and biscuits? I guess I can’t ever be sure, but I also cannot be in control of their food intake for ever. I want them to listen to their inner signals and to have a good grasp of nutrition. The more I trust them and let go, the more they surprise me. So we talk about how sugary foods are absolutely delicious and all foods are great to eat but too many lollipops, cakes, biscuits, dried fruit can lead to tooth decay and tummy ache. On those occasions when the children do over-eat sweeter foods it is a great chance to talk about how that feels. A recent example being Eton Mess, my girl had a serving, then came back to ask me if she could have more. I suggested she think about her tummy and decide herself. After another serving she felt a bit sickly and later on reflected on this being due to the sweet, creamy dessert. Now if I had told her not to have another serving she would have just felt a bit disgruntled, whereas now she understands more about listening to her body. Fullness = my tummy has had enough, it feels uncomfortable, my mouth has eaten enough, I’m not empty. Hungry = rumbles and my tummy aches. Sometimes when I’m hungry I don’t have my energy. Miss K has always been good at stopping when she is full. the J-boy is another kettle of fish. He will happily keep munching on foods such as biscuits unless you remind him to tune into his tummy. Distraction for him is a biggie. Yesterday in the car he had been given a pack of biscuits, he asked how many to have and I asked him to ask his tummy and see after 1 if he should have another or keep it for later. He happily munched his way through 2 and stopped. Now I’m pretty sure it would have been 3 or 4 biscuits if he had been watching TV whilst snacking or distracted. Nutrition Facts. Now I’m not organised enough to sit down with them and give planned nutrition lessons, I find relaxed or undercover stealth like approach works best. So don’t feel you need to become a teacher to teach nutrition. When we eat a meal we tend to have a few facts about the food we are eating and talk about the meal. It could be where the meat comes from, how something is grown, the colours on the plate or why something is good for your body. My kids love a handy fact and they will then repeat things back at a later meal. This can prove amusing when someone else is eating a food that they know about. Your language matters. How you talk about food is so important. Labelling foods as good/bad, healthy/unhealthy, treats or special foods put those foods up on a pedestal. If there are foods that you disapprove of your children will soon pick up on it. I feel like it is a daily occurance that I am having to challenge my own thinking on this and change my words/tone. It seems I am not alone, phew. Eat using the Senses. Talk about how food tastes, smells and the texture. This can help them to zone in on what they are eating and to not eat it without noticing. 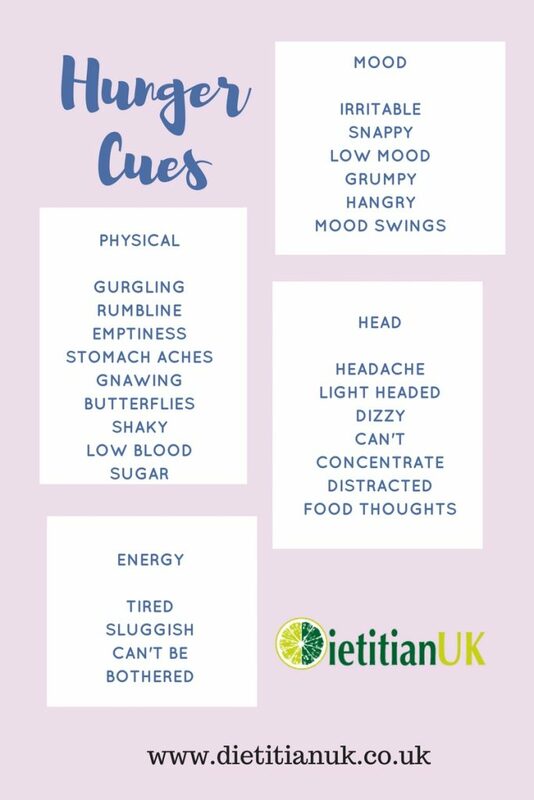 One way we have done this recently is to talk about taste buds, where they are in the mouth and what you are tasting when you eat certain foods. My boy enjoys the noises that foods make and how they feel when he eats them with his fingers. Yes it may be not be good table manners but it is a way to get him to connect with his food and think about what he is eating. Later in life people spend lots of time getting back to mindful eating… our children can teach us alot about enjoying our food. I’d love to know your thoughts. How do you talk about food at home?